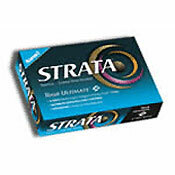 The Strata Tour Ultimate Plus extends the capabilites of Strata Tour Ultimate's patented Concentrated Core and Multi-Layer Technology. The Tungsten Energy Core combined with a Spinthane cover created a golf ball that has superior driver distance and exacting spin for control and consistent performance around the green. This ball acts like the Top Flite Tour (Now Strata Tour Soft) but with a little more distance and a much firmer feel. Spin is voracious, but the cover disintegrates instantly. I know a soft cover equates to high spin, and usually I don't mind some scuffing, but geeeeeez. I've never had a ball become unusable as fast as this one. It makes the Ben Hogan Apex Tour seem indestructible. Not worth the money. New Tour premium (just like Ben Hogan Hawk) seems a better bet for the same price. Top Flite Tour, Tour Ultimate, Tour Ultimate 2, Nike TA, etc. Truly a ball that does it all. Distance, feel, spin and it putts like a Strata! I've been around the horn with every ball in the marketplace under $30 a dozen and even if the ball scuffs easily, and it does, this ball is my pick. Try it you'll like it. I think this ball is awesome. I hit it straighter and longer than most and it feels nice and soft. Easy to get it to stick on thte greens. All in all a great ball. Hit this ball longer than any other ball played. Did not have any problem with durability. I used to play the Titlest nxt tour ball until I hit this one. Mixed feelings on this ball. Bought a dozen of these and while they perform pretty good, they have no durability. They are very accurate from the fairway and really nice around the green, but the shredding takes a lot away from my appeal. Can't honestly recommend. I tried this ball and the Strata Tour Ace at the same time. I preferred the Tour Ace. However, I've switched back to the Pro V1, which really does seem to be improved - it feels better than any other ball and goes farther than the Tour Ace or this ball.